On September 16, 2016, Terence Crutcher, a 40-year-old motorist, was shot and killed by police officer Betty Jo Shelby in Tulsa, Oklahoma. He was unarmed during the encounter, in which he was standing near his vehicle in the middle of a street. Terence Crutcher lying on the ground moments after he was shot. From aerial footage taken by Tulsa police department. 36th Street North and Lewis Avenue, Tulsa, Oklahoma, U.S. The shooting led to protests in Tulsa. On September 22, the Tulsa County District Attorney charged Shelby with first-degree manslaughter after the shooting was labeled a homicide. On May 17, 2017, a jury found her not guilty of first-degree manslaughter. Terence Tafford Crutcher, Sr. (b. August 16, 1976) was a 40-year-old black man. Crutcher's sister described him as a father and said that, at the time of his death, he was enrolled to study music at Tulsa Community College. According to her, he was also involved in his church and sang in the choir.. The officers involved in the incident at Tulsa, Oklahoma, on September 16, 2016, were Betty Shelby and Tyler Turnbough, both of whom are white. Turnbough became an officer in 2009 and Shelby in 2011. At 7:36 p.m. on September 16, 2016, police received a 9-1-1 call about an abandoned vehicle in the middle of 36th Street North just west of Lewis Avenue. One caller said: "Somebody left their vehicle running in the middle of the street with the doors wide open." "The doors are open. The vehicle is still running. It's an SUV. It's like in the middle of the street. It's blocking traffic." "There was a guy running from it, saying it was going to blow up. But I think he's smoking something. I got out and was like, 'Do you need help?'" "He was like, 'Come here, come here, I think it's going to blow up.'" The other caller said: "There is a car that looks like somebody just jumped out of it and left it in the center of the road on 36th Street North and North Lewis Avenue." "It's dead in the middle of the street." "It's a Navigator. The driver-side door is open like somebody jumped out. It's on the yellow line, blocking traffic. Nobody in the car." Police stated that Crutcher kept reaching into his pocket, refused to show his hands, walked towards his vehicle despite being told to stop, and then angled towards and reached into his vehicle. Critics have disputed this saying that the driver's side window was up when Crutcher was shot. Turnbough tased Crutcher, and Shelby shot him. Shortly before the shooting, officers in the helicopter conversed with each other: "This guy's still walking and isn't following commands." "It's time for a taser, I think." "I've got a feeling that's about to happen." "That looks like a bad dude, too, could be on something." Approximately two minutes after the shot, an officer checked Crutcher's pockets, and approximately 45 seconds later, someone crouched to offer aid. Police said Crutcher died in the hospital later that day. Tulsa police chief Chuck Jordan said no weapon was recovered from Crutcher's body or vehicle. Police dashcam and helicopter video as well as the dispatch audio were released by police on September 19, 2016. Tulsa Police Chief Jordan called the video "disturbing" and "difficult to watch". The officers involved were placed on paid administrative leave. Crutcher's sister said at a press conference, "You all want to know who that big, bad dude was? That big, bad dude was my twin brother. That big, bad dude was a father. That big, bad dude was a son. That big, bad dude was enrolled at Tulsa Community College — just wanting to make us proud. That big, bad dude loved God. That big, bad dude was at church, singing, with all his flaws, every week." The Tulsa Police Department started a criminal investigation of the shooting. Homicide Sergeant Dave Walker stated that PCP had been recovered from Crutcher's car. Shelby's attorney had previously stated that she thought Crutcher might be under the influence of PCP based on what she learned during her drug-recognition training. Crutcher's father had stated in a 2012 affidavit that his son had a history of PCP use. The police department paid $216,000 in overtime costs for 10 days after the death for services related to increased demonstrations, staffing of patrols, marches, Crutcher's funeral and news conferences by the district attorney and Crutcher family during which the Incident Management Team also had a command post operating. The United States Department of Justice opened a civil rights probe into the shooting. Dozens of protestors gathered on September 19 by the courthouse. Ahead of the release of the video and audio recordings, the Tulsa chapter of Black Lives Matter held a protest outside the courthouse. 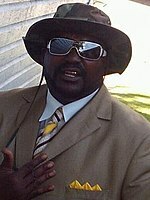 Crutcher's family, protestors, and the American Civil Liberties Union of Oklahoma called for Shelby to be charged with his death. Autopsy results released by the Oklahoma State Medical Examiner indicated that Terence Crutcher had "acute phencyclidine (PCP) intoxication" at the time of the shooting. The report stated that Crutcher had 96 nanograms per milliliter of PCP in his blood at the time of death. The report also indicated that tenocyclidine (TCP), a psychostimulant and hallucinogen which is more potent than PCP, was present. Tulsa County District Attorney Steve Kunzweiler charged Shelby with first-degree manslaughter. Shelby turned herself in at the Tulsa County Jail on the early morning of September 23, where she was booked and was shortly released after posting a bond of $50,000. Shelby was accused of "unlawfully and unnecessarily" shooting Crutcher. On May 17, 2017, a jury found Betty Shelby not guilty. ^ a b c "Terence Crutcher, black man shot once by a Tulsa police officer, was unarmed". BBC. September 19, 2016. Archived from the original on September 20, 2016. Retrieved September 19, 2016. ^ a b Hawkins, Derek (September 19, 2016). "Black man shot by Tulsa police had hands 'in the air,' says pastor who reviewed video of the shooting". Washington Post. Archived from the original on September 19, 2016. Retrieved September 19, 2016. ^ a b c d "Man fatally shot by Tulsa police had no gun, chief says". CBS. September 19, 2016. Archived from the original on September 20, 2016. Retrieved September 19, 2016. ^ a b Juozapavicius, Justin (September 19, 2016). "Tulsa Police Say Man Had No Gun; Video Show He Had Hands Up". ABC. Associated Press. Archived from the original on September 19, 2016. Retrieved September 19, 2016. ^ a b c d e f g h i Salinger, Tobias (September 19, 2016). "Video released in fatal police shooting of unarmed Oklahoma man Terence Crutcher (WARNING - GRAPHIC)". New York Daily News. Archived from the original on September 20, 2016. Retrieved September 19, 2016. ^ "TPD Identifies Man Shot And Killed By Tulsa Police In Friday Incident". KOTV-DT. September 17, 2016. Archived from the original on September 20, 2016. Retrieved September 20, 2016. ^ a b c Chappell, Bill (September 20, 2016). "After Police Killing Of Unarmed Man, Tulsa Chief Promises To 'Achieve Justice'". NPR. Archived from the original on September 21, 2016. Retrieved September 20, 2016. ^ Stack, Liam (September 19, 2016). "Video Released in Terence Crutcher's Killing by Tulsa Police". New York Times. Archived from the original on September 20, 2016. Retrieved September 19, 2016. ^ Davis, Dave (September 19, 2016). "Tulsa Group Protests Police Shooting Of Terence Crutcher". NewsOn6.com. Archived from the original on September 20, 2016. Retrieved September 20, 2016. ^ Cleary, Tom (2016-09-20). "LISTEN: Terence Crutcher Shooting 911 Calls & Dispatch Audio". Archived from the original on 2016-09-24. Retrieved 2016-09-24. ^ "The Latest: Attorney: Release any police video of shooting". Washington Post. Associated Press. September 19, 2016. Archived from the original on September 22, 2016. Retrieved September 19, 2016. ^ Blau, Max; Morris, Jason; Shoichet, Catherine E. (September 20, 2016). "Tulsa police shooting investigated by Justice Department". CNN. Archived from the original on September 20, 2016. Retrieved September 20, 2016. ^ a b "Tulsa Officer Shares Her Side of the Story in Terence Crutcher's Shooting". ABC News. 2016-09-21. Archived from the original on 2016-09-22. Retrieved 2016-09-22. ^ Corey Jones and Samantha Vicent (September 23, 2016). "Whether Terence Crutcher's SUV window was up or down still questioned; Shelby did have Taser, police say". Tulsa World. Archived from the original on July 10, 2017. Retrieved May 23, 2017. ^ a b Barajas, Joshua (September 19, 2016). "Tulsa police release graphic footage of fatal shooting of Terence Crutcher". PBS. Archived from the original on September 19, 2016. Retrieved September 19, 2016. ^ "Tiffany Crutcher sister of Terence Crutcher who was shot by Tulsa Police talks at a press conference". Tulsa World. Archived from the original on September 26, 2016. Retrieved September 29, 2016. ^ Rooney, Kyle (September 20, 2016). "Tulsa police open criminal investigation on shooting". Hotnewhiphop. Archived from the original on September 21, 2016. Retrieved September 20, 2016. ^ a b c "Police say PCP found in vehicle occupied by Terence Crutcher on Friday". Tulsa World. September 21, 2016. Archived from the original on November 17, 2016. Retrieved September 21, 2016. ^ "Terence Crutcher was turning life around before fatal Tulsa police shooting, family says". The Chicago Tribune. September 20, 2016. Archived from the original on September 21, 2016. Retrieved September 20, 2016. ^ Jones, Corey (October 17, 2016). "How much did Tulsa police spend on overtime in aftermath of Terence Crutcher killing?". Tulsa World. Tulsa World. Retrieved May 7, 2017. ^ a b "Latest: Protesters want arrest of officer in Tulsa shooting". Fox News. Associated Press. September 19, 2016. Archived from the original on September 20, 2016. Retrieved September 19, 2016. ^ Drakeford, Cortney (September 19, 2016). "Terence Crutcher Graphic VIDEO: Family Demands Justice, Police Announce Officer Killed Unarmed Oklahoma Man". International Business Times. Archived from the original on September 23, 2016. Retrieved September 19, 2016. ^ Writer, Samantha Vicent World Staff. "Update: Finding of PCP in Terence Crutcher's system called 'immaterial' by family's attorneys". Archived from the original on 2017-06-28. Retrieved 2016-10-11. ^ EndPlay (12 October 2016). "Toxicology reports show Terence Crutcher had PCP in system at time of death". Archived from the original on 12 October 2016. Retrieved 12 October 2016. ^ Chappell, Bill (September 22, 2016). "Tulsa Police Officer Will Face Manslaughter Charge In Unarmed Man's Death". NPR. Archived from the original on September 23, 2016. Retrieved September 22, 2016. ^ "2014 Oklahoma Statutes :: Title 21. Crimes and Punishments :: §21-715. Manslaughter in the first degree a felony". Archived from the original on 2016-10-02. Retrieved 2016-09-28. ^ CNN, Ana Cabrera, Catherine E. Shoichet and Sheena Jones. "Tulsa Officer Betty Shelby booked, released on bond". CNN. Archived from the original on 2016-09-27. Retrieved 2016-09-28. ^ Levenson, Eric; Gamble, Justin (May 17, 2017). "Tulsa cop not guilty in fatal shooting of unarmed black man". CNN. Archived from the original on May 18, 2017. Retrieved May 18, 2017.